One thing that’s a problem with converting to a vm, is if you have an OEM version of Windows installed. An OEM license is tied to the hardware that you have it was installed on which means that you cannot move this to another machine. The problem arises when you have been using that server for years, have a lot of software and settings on it, the hardware is getting old, and you need to convert it to a VM. When you convert it to a VM, Windows Activation notices that an OEM license is installed on new hardware, and basically will not allow you to login and will shut the server down. The most frustrating part about this is that you may have a valid open license, but W2k3 does not allow you to upgrade the license by any conventional means. 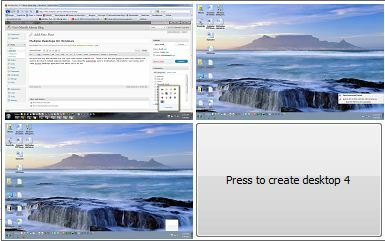 NOTE: W2k8 DOES allow you to switch licenses, so if you have an OEM license installed, BEFORE you convert it, you simply need to right-click on Computer, go to properties, and click “change key” towards the bottom, enter your valid key, and it should convert with no licensing problems. NOTE: This should be done in a test environment only after a valid backup to your server. I am merely providing you with instructions that worked for me. They may not work for you. I am not responsible if this does not work or something does not work properly for you. It shouldn’t be a problem since you will not be altering the original server, and if something goes wrong or you run out of time, you can just delete the VM and turn the original machine back on. Just in case always have a backup of your machine before you try anything. A valid open Windows 2003 license for either the 32bit or 64bit version that you are converting to a virtual machine. A valid W2k3 Volume License CD or ISO. You may need use Disk 2 of the server install so keep that in mind. If you’re using ISO’s you should mount both of the disks before you start the VM, that way you don’t have to worry about it. Obviously a working vmware server. A timetable of around 3-5 hours depending on how big your server takes to convert, your internet connection speed to download/install the updates. Install all Windows security updates to your W2k3 installation before you do this and make sure it is working properly after. This is important because you will most certainly need to reinstall all of these updates later before your server works properly. Use vmware converter to convert your server to a virtual machine. If possible shut down your old W2K3 server. Add the CDRom of your virtual server, OR If you have iso files, then choose the path to the ISO files that you copied. If you have disk1 and disk 2, then add 2 drives. Make sure that Connected And/Or Connect at Power On is checked. While still in the “Edit Settings” screen, go to the “Options” tab, then click on “Boot Options” and click the box to force you into the bios settings. At this point you may want to shut down the original server so there are no conflicts. It should boot to the BIOS, Go to boot options \, and make sure your cd rom is the first boot device. Choose “Install”, then when it finds your operating system, then repair it. Now you want to install VMWare Tools. Do this in Vsphere Client by going to the VM menu, then Guest, then “install/upgrade VMWare Tools”. it takes about 20 seconds for the install dialogue box to come up so be patient. Now you need to install updates from Windows update until there are no more (even with the SP2 install, there were a ridiculous amount) and if everything goes ok you should be good. If it gives you an error when clicking Windows Update See The Notes Below. Change the IP address in Windows to that of the old server, remember to shut down the old server. Note: When changing the IP address in Windows it will give you an error about a hidden network adapter, that was the adapter that was part of your physical box on your other machine. Note: On one machine, when trying to click Windows Update from the IE Tools menu I got an error “the requested lookup key was not found in any active activation context” To resolve this I opened up a run prompt, navigated to c:\windows\ie8\spuninst\ and ran spuninst.exe. This uninstalled IE8 and restored the update functionality in IE6. I noticed that a lot of people were bypassing my proxy using Firefox Portable and other standalone browsers. I am using a proxy installed on a machine that is not directly attached to my default gateway, so I have them pick up the proxy address from wpad, and lockdown the proxy settings page in IE through Group Policy. Once you have a rule like the above setup, you can add a few exceptions in for your servers, etc. by placing an “allow” for those addresses with a lower priority than the deny. In the example above, I created an Address Group and can add IP addresses/hosts to it whenever I need. I would put an allow entry in where the source is my Server IP, the destination is ANY, and the service is Http/Https, at a priority of 17/18, which would process before the deny. To make it easier you can create a Service Group containing both HTTP and HTTPS ports so you don’t have to put every exception in twice as well as the address group to contain the hosts you would like to allow this way you do not have to create an entry for every ip address. Obviously, The best way to use a proxy is to use two nics and place the server/device in front of your router, or use a content filtering solution that is installed on the router itself since all traffic leaving must go through this server/device to get out. Sonicwall has one, Cisco has one on a certain series of routers. However, if you have a proxy working on a standalone server that is not installed in front of your gateway so that all traffic has to pass through it, then the above solution should suffice. Everyone out there has a different setup so this will help when you do not have the luxury of having this type of setup. There is a also an ADM out there that allows you to configure Firefox through Windows Group Policy, however, since Firefox standalone is not actually installed on the machine and does not contain registry entries, I’m not sure that this will work, so you might want to investigate that. Another person has a great writeup on how to create your own. If you need to enforce more than just proxy settings then you should take a look at it. Here’s another writeup I had on autoconfiguration setup a little while ago that addresses how to set it up and contains links at the bottom on troubleshooting and concerns with using wpad. Not sure how long this has been out, but I just came across a helpful tool. Those of you who use Ubuntu or most other Linux versions are familiar with multiple desktops. I was using the sysinternals suite to troubleshoot a file problem i was having, and I came across Desktops application that allows you to do this. It is ridiculously easy to use and you can set it to load on startup. You can also easily switch between screens with shortcut keys just like Linux. It also has some limitations, such as you can’t close windows once they are created (need to logoff to close). For more info or to download you can visit here or just get it as part of the sysinternals suite which contains great tools for troubleshooting and maintenance. First off I am using GFI WebMonitor 2010 for my web proxy. I like this product because it includes its own proxy server so I did not have to purchase ISA server in order to run this on. I use a hardware router so purchasing ISA just to run a web proxy seemed to be a waste of money. This automatically creates your wpad.dat file and publishes it. 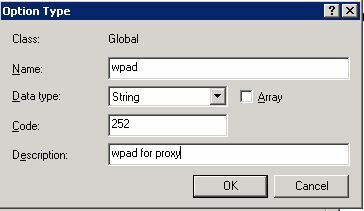 Then I needed to create the entries in DHCP and DNS to point to the WPAD so browsers could find and use the proxy server. The main problem I ran into is that computers on the local network where the proxy is located picked this up automatically and gradually started redirecting to my proxy server, but computers on my other subnets would not pick this up. I assume that the router was blocking some sort of broadcast, so I decided to put the entries in both DHCP and DNS to circumnavigate this as there is a router or 2 that is controlled by another consultant. In DHCP this is pretty easy to do although you need to add option 252. 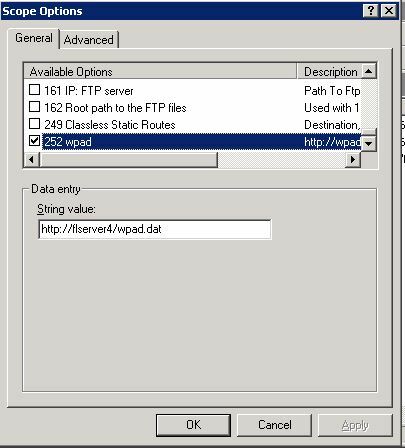 In DHCP, right-click on your server and click on “Set Predefined Options”, Click “Add”, for the code enter “252”, for the name enter “wpad” and for the “data type” enter “String” Why its not there by default is baffling, but it’s easy enough to add. Now for the DNS entry. Under Forward Lookup Zones, Enter a new alias (CNAME), call it wpad, and then point it the server that houses your wpad file. This should replicate to your other DNS server. For testing purposes just make sure that you do it on the first server listed when performing an IPCONFIG /all. There’s one more thing to do. Go to your DHCP server, right-click and go to Scope Options, and select “252”, then enter your string value. Mine is http://myserver/wpad.dat . Something to note on this address is that I read that it may be case-sensitive so just enter it lowercase to save you the headache. That should be it. Here’s some reference and troubleshooting articles as well as some other sources where I pieced together all of the information from. Security info about WPAD and Man In the Middle Attacks.